Someday there won’t be anymore need for airports or air travel at all so at least one venue employed by terrorists will be eliminated. Of course everything comes at a cost and in this case it will be the sense of place that will be the sacrificial lamb. The ubiquity of modernity is such that there's really no point in going anywhere. Oh, sure there are the old towns, old San Juan, the Jewish section of Prague. But these are outliers which will be destroyed by the juggernaut of progress. After Palmyra was liberated, Maamoun Abdulkarim Syria’s Director of Antiquities told The Times that “80 percent of the Unesco World Heritage site that encompasses the 2000 year old ruins remained intact.” (“Scenes from Palmyra Indicate ISIS Slowed Down Assault on Treasures," NYT, 3/28/16). This is naturally a relief. But apart from terrorists with their fundamentalist agendas, the past is being attacked simply by a compulsive level of invention and innovation that makes planned obsolescence obsolescent. 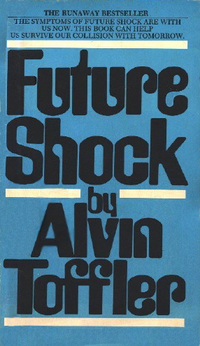 The title of the late Alvin Toffler's book Future Shock was prescient. Moore’s Law, created by Intel’s microprocessor guru, predicted a exponential increase in transistor capacity and the world of computers has become a paradigm for modern life. Technocrats don’t necessarily chop off heads or drown their enemies in cages. The insidiousness of their products lies in the fact that they can’t be stopped by political interventions. Horse drawn carriages, which the De Blasio administration, had been trying to retire for humane purposes are just a curiosity. “Get a horse” used to be the expression. Pretty soon you won’t even need a car. Reality will be a succession of holograms, furnished by the same utilities that once provided us a with an outmoded form of entertainment called cable TV.